I hope you all had a lovely weekend last week. It was Labor Day weekend and we spent it laboring over our truck which needed several repairs to stay safely on the road. We finished off a little glass bottle of almond extract a few months ago and looked at the tiny bottle critically, trying to decide if it would be useful to re-purpose it. As it happened, we had a scant bit of silver rum left, too little for a set of drinks but too much for most recipes. Our chocolate mint plant was doing great, sending out lots of little shoots ecstatically seeking the sun. Put everything together and you get homemade chocolate-mint extract! We took a small jar, stuffed it about half-full with clean mint leaves, then poured the rum over it. After that, the process is even simpler: Stick it in a dark, cool section of the pantry for about a month. Try not to forget it’s there. When you finally remember where you put it, open the jar and sniff. It should smell like mint extract! The mint leaves will have given their all and will be dark brown and icky-looking. All that’s left is to strain the extract into the jar you’ll use to keep it. It’s best if it’s dark glass, like the bottles you see in the store. I wanted to make something with it that would show off the extract so I could see how well it came out. Well, it IS a chocolate-mint extract, so how about Chocolate Mint Ice Cream? I’d found a fast, incredibly simple vanilla ice cream from Eagle Brand that I wanted to try. I’m terrible at making ice creams and sorbets – nothing ever seems to come out well, or it’s so rock hard it’s impossible to eat without nuking it to death. This one was supposed to be fool-proof. In fact, there are only five ingredients, if you count the chocolate chips. Vanilla is even easier with only three. All I can say is: I will not be making ice cream any other way for a very, very long time. It’s creamy. It’s rich. It’s easy. And IT WORKS. There’s a lot of variations that can be used on this ice cream base too! Half-n-half isn’t required, per se, but you do need to have some fat in there to make it creamy and scoopable. Foodsubs notes you would need 1 1/2 tbsp of butter for every 7/8 cup of milk to make 1 cup of half-n-half (10 – 18% fat). I’ve mixed heavy cream with skim milk, for instance, and that seemed to work out well. It’s even easy to scoop right out of the freezer the next day. I was impressed. And the mint flavor? Absolutely incredible. At least one day ahead of time, place the bowl of your ice cream maker in the freezer. Stick the can of sweetened condensed milk in the fridge. When you’re ready to make ice cream, stir together the half-n-half and sweetened condensed milk in a large bowl. Add both extracts. Stir thoroughly. Start your machine and slowly pour in the ice cream base. When the ice cream is thick, sprinkle in chocolate chips. Follow your manufacturer’s recommended freezing instructions. I have a Krups model which took about 30 minutes to reach my desired consistency. I sprinkled in chips about halfway through. 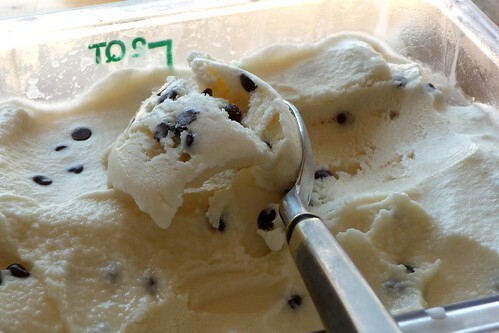 Scoop out the ice cream into a freezer-safe container and freeze for 2 – 3 hours to harden it before serving. It’s creamy. It’s rich. It’s easy. And IT WORKS. This entry was posted in american, ice cream, recipes, snack, untranslated. Bookmark the permalink.